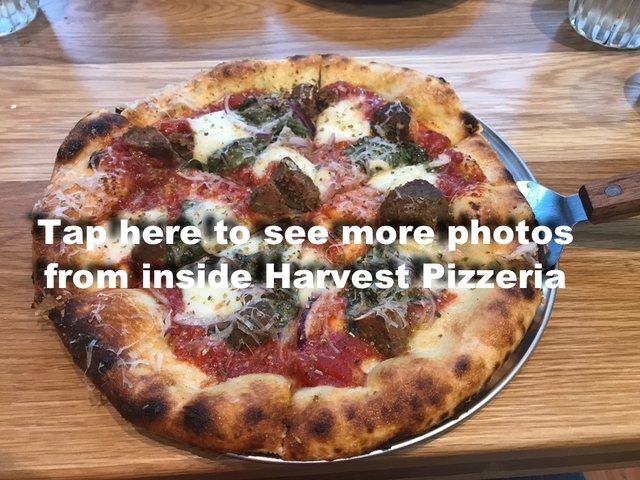 CINCINNATI -- Harvest Pizzeria debuted its fresh take on pizza Friday when it quietly opened its doors across from Findlay Market. The pizzeria, located on the first floor of the Crown building at 1739 Elm St. in Over-the-Rhine, specializes in creating pizzas using locally sourced ingredients. "We've got at least 10 local farms on our list," said general manager Seth Barnes. The store is the fourth Harvest Pizzeria location in Ohio. Owner Chris Crader opened the first in Columbus in 2011, followed by two other locations in that city. Seth Barnes' brother, Taylor Barnes, is the executive chef for the Over-the-Rhine location. The Barnes brothers are Cincinnati natives. Taylor Barnes said he worked for Crader in Columbus for the past six years. "We wanted to come back down to Cincinnati and bring some really good craft artisanal pizza home," Taylor Barnes said. "We focus on all local, organic specialty products." Those products include not only oven-fired pizzas but small plates, salads and hamburgers made with fruits, vegetables and meats sourced from farms near Cincinnati and Columbus, Seth Barnes said. "Greater Cincinnati has been like a dream for finding locally sourced stuff," Seth Barnes said. Small plates include items such as olives, pickle chips, Brussels sprouts and buffalo cauliflower priced between $6-$8. The four salads on the menu range from $5-$12 and guests can order them in either half or full portions. The two beef burgers on the menu are $12 each; a vegetarian burger is $13. All three sandwiches are served on Klosterman buns. There are 14 signature 12-inch pizzas on the menu and a create-your-own option as well. Those pizzas cost between $12.75-$18.75. There is also a daily lunch special: a 9-inch pizza for $8 and a small salad for $2.50. The Over-the-Rhine Harvest location seats about 70 people and includes a fully stocked bar featuring craft cocktails and local craft beers. Harvest Pizzeria's regular hours will be 11 a.m.-10 p.m. Monday-Thursday and 11 a.m.-11 p.m. Friday-Saturday.